OK today’s bag is a cute little BIsou Bisou purse perfect for anyone who love a pop of pink. Silver hardware with ivory whipstitching. Great for going out or to church. The faux buckle lifts to reveal a gusseted front pocket. This was donated by Jaiya, who models it and her newly temporarily straightened hair. 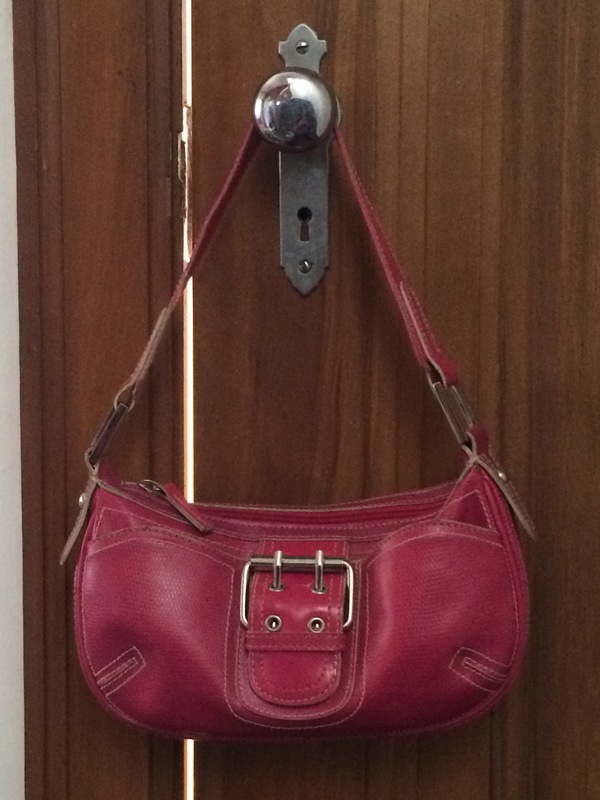 This entry was posted in 2015 Lent bag giveaway and tagged Bisou Bisou, church, Handbags and Purses, pink on March 15, 2015 by miriamgmck. today is really day 50 in the world of the 50 days of Easter. but for me, it’s day 49 on my journey. i brought it full circle with a bag i’ve had for around 28 years. back in my high school days – early to mid ’80s, Pier 1 sold clothing, scarves, bags and earrings. the stuff was so cool – boho long before the word boho existed. i couldn’t wear a lot of the clothes, maybe a skirt here or there, but i could definitely work with the scarves and bags. i got this one when i was maybe a senior in high school. sometime around there. i was drawn to the shells. 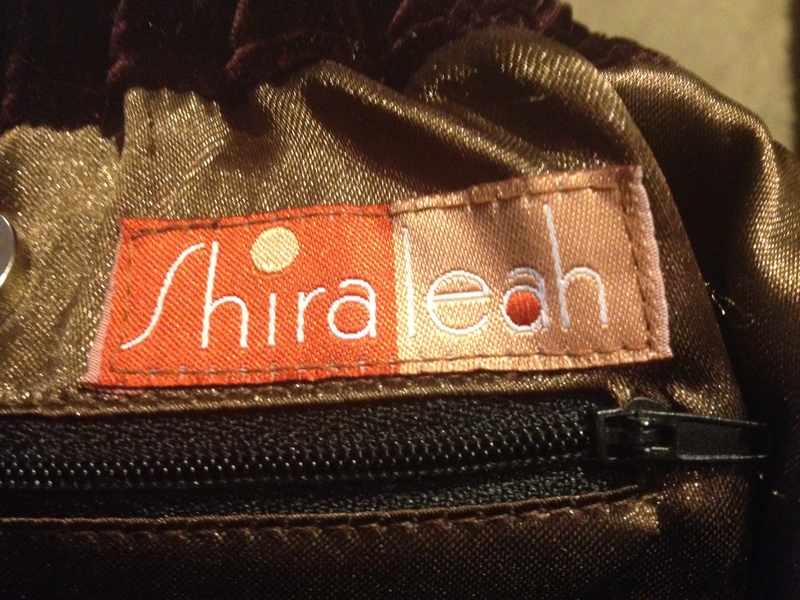 so how has this bag stayed in the family when many others i’ve had through the years have been given away? it’s the shells. i love cowrie shells. maybe you’ve heard, but wikipedia can tell you: they were used as currency in Africa, Asia, and North America, and also as a sign of rank and authority in some cultures. they are also worn as jewelry and adornment in clothing and the hair, and are a sign of womanhood and fertility. i made a cowrie shell necklace for my wedding and put a fertility symbol on it to boot, and wore cowries in my hair. let’s just say it worked and leave it there. i think cowries are beautiful. they also feel great to play with – i read they’re also used as dice. i have a dish of them in my living room. i grabbed this purse because i knew i was at the end of this journey and it woudn’t be complete without this bag, as it has been with me for so long. also, i needed red for Pentecost. my church, Calvary Episcopal Church, had a joint service with my childhood parish, St. Andrew’s Episcopal Church at a park in Mt. Airy forest. what a blessing THAT was! the bag’s faded a little through the years, in part because i have it handing on my closet door where i can see it every day. as i typed those words i was overcome with emotion. doing this work has reminded me of the many lessons that the strong women in my life, primarily mom and Joy, have taught me: live in the moment. appreciate and enjoy what you have. try to make someone else’s life better on your way. of course there are more, like those involving raggedy underwear… but we’ll leave those alone for now. i remember one day coming home from working at the downtown library. we were living with my parents while david was getting his mba and n was a baby. this particular day, i had been asked for money by homeless people repeatedly. i asked mom, what do you do when people ask you? i feel bad when i don’t give, but i don’t always want to. here’s what she said: when the spirit moves you to give, give. if you don’t feel moved, don’t. either way, pray for that person and keep going. and pray for yourself to be open to the voice of the spirit within you. This entry was posted in various places and tagged Calvary Episcopal Church, church, cowries, cowry, Easter, Episcopal, Episcopal Church, family, friends, Handbags and Purses, Holy Spirit, mom, patterned bag, Pentecost, Religion and Spirituality, shells on May 19, 2013 by miriamgmck. 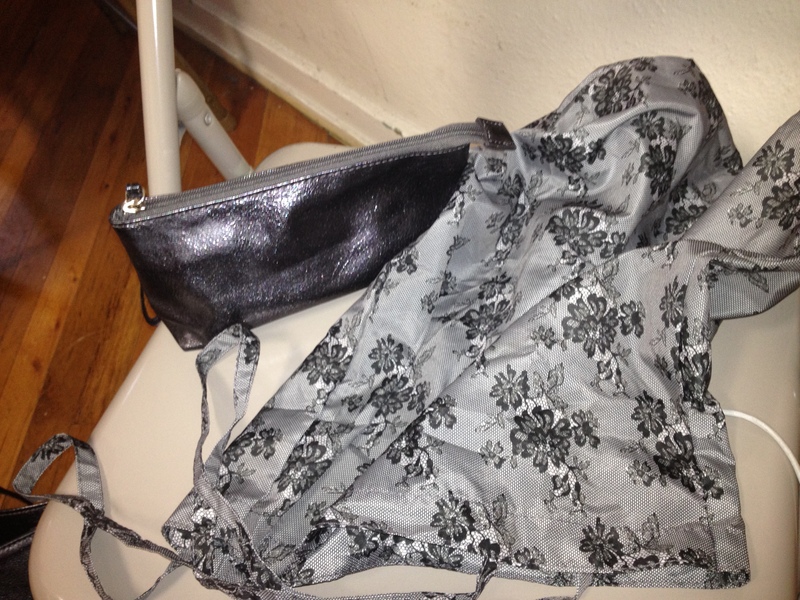 i was excited to bust out purse i got a few weeks ago at st. vincent de paul’s. this whole east-west thing with purses having a trapeze shape is happening right now, and while i think it’s cool, i’m not so into my purse looking like you should be trying to tuck in the sides. 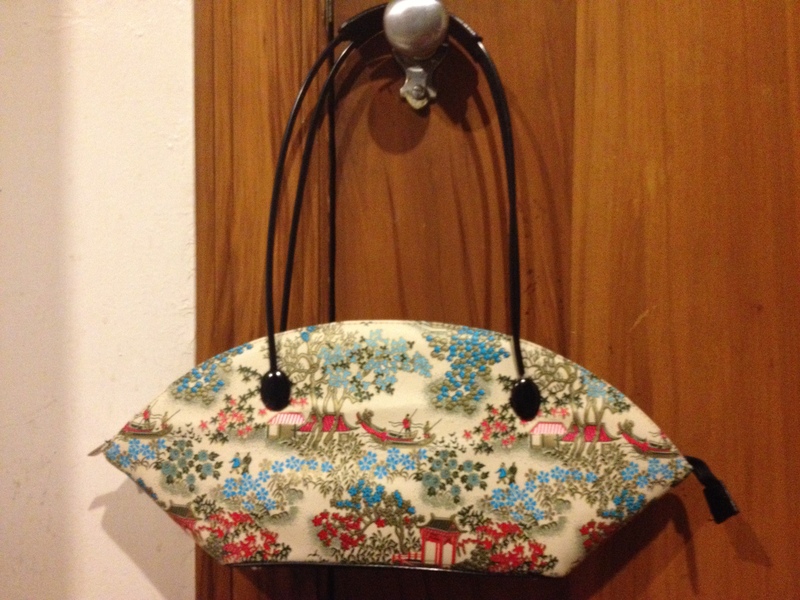 so when i saw this purse i thought ok, i’ll rock the shape but in this cool pattern and for $3. score! wore it to church today, which is always fun. today was our heifer fair – if you don’t know about this wonderful organization, check them out at http://www.heifer.org. back to the purse. once i saw the pattern, it was mission: no bag left behind. 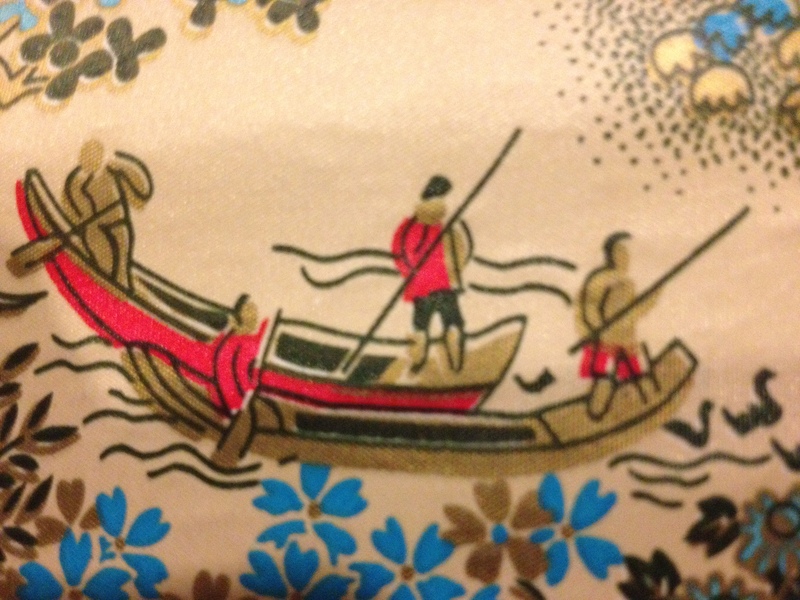 here are a couple of closeups of the boat and trees. the handles are wire covered in black tubing with leather top handles. the inside has 3 pockets, which help. this is definitely a purse i’d use for a special occasion or for sunday, but it’s just not practical enough for everyday wear – it doesn’t hold my water bottle, and you know by now that’s the dealbreaker. my girls really like this one, especially my youngest – she’s been waiting for me to use it for several days now. she’ll have to find something else to think about – like whether or not she packed her dance stuff in her backpack. hmmm? 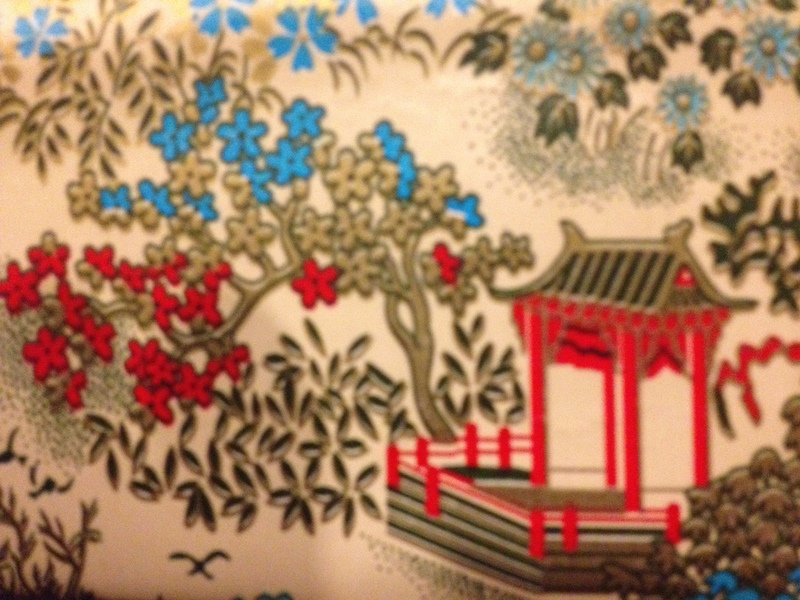 This entry was posted in thrifting and tagged Asian-inspired, church, dance, daughters, Episcopal, Handbag, Handbags and Purses, heifer international, patterned bag, Shopping, st. vincent de paul, sunday, thrift store, thrifting on April 28, 2013 by miriamgmck. 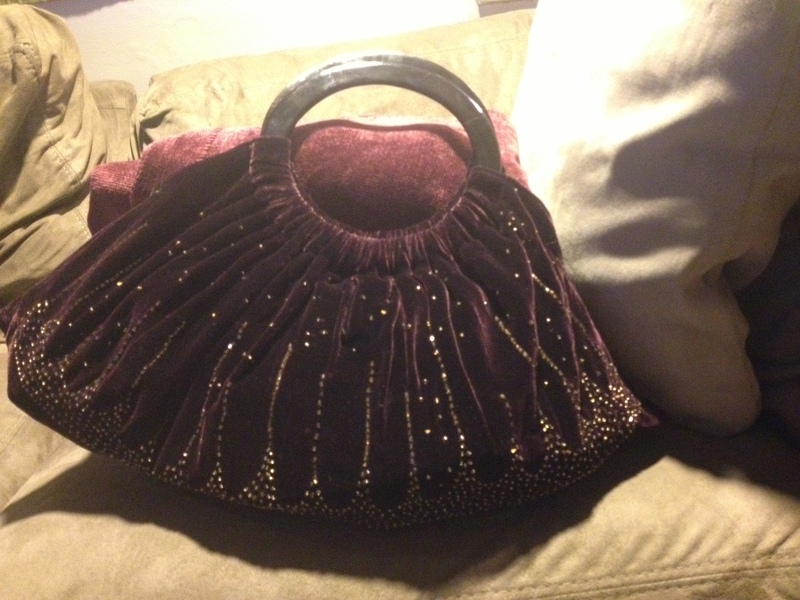 it’s sunday, so i went fancy again with this shiraleah velvet beaded bag with horn handles. this is another bag that i got at st. vincent de paul that is just so beautiful, i love to look at it hanging on my closet door. so when i chose it for today, i had no idea it could carry all of my stuff, plus water bottle and Godly Play teacher’s book. but it did, thank goodness. $4 – score! then i wore it to A Midsummer Night’s Dream ballet at SCPA. an amazing show, with lots of talented students giving their best. the set was beautiful. i’m so glad j is getting a wonderful dance education there. anyway, i’m off to burbank tomorrow, so i’ve got to go find some packable bags for the trip. praying that my flight is better than the last one a couple of weeks ago. 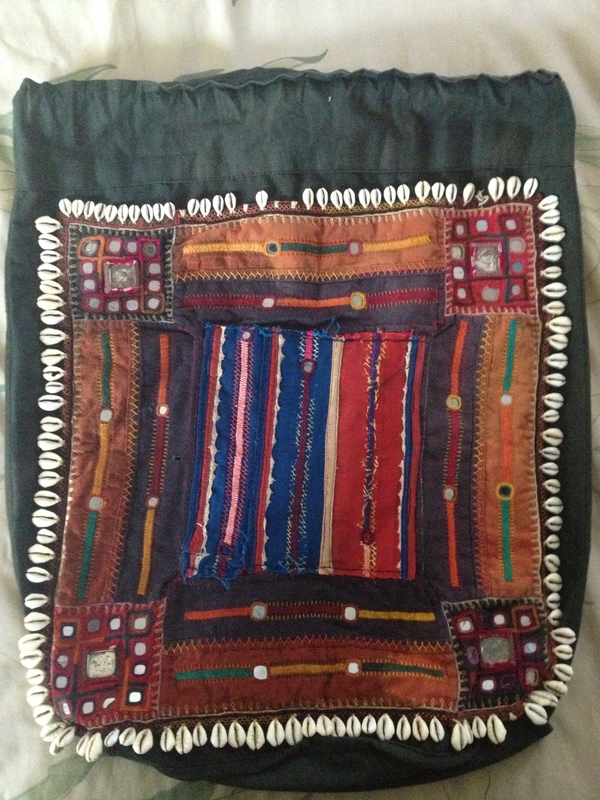 This entry was posted in thrifting and tagged beaded bag, church, Godly Play, oxblood, SCPA, shiraleah, sunday, thrift store, thrifting, travel on April 21, 2013 by miriamgmck. time for animal print. 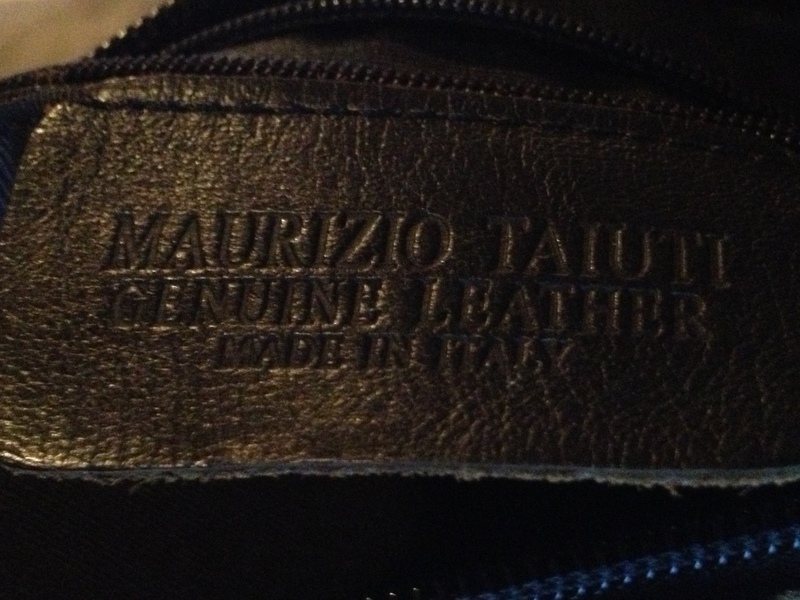 i found this Maurizio Taiuti on the clearance rack at tj maxx for $49, then went to another one where it was on even more clearance for $39, so i did the switcheroo and saved. the original price was listed as $120. as a 30-year tj maxx shopping veteran, i can spot a well-made italian bag from the men’s department. 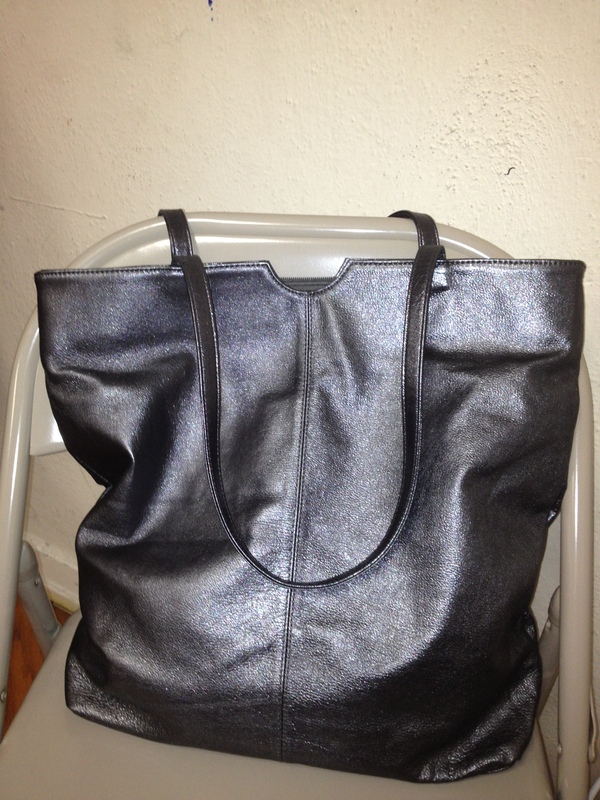 the leather has an iridescence that you can see in the close-up pic. the strap is long, which is great for us taller, larger ladies who want a crossbody but don’t want it to cross the body in an unfortunate spot. i’m a sucker for grommets, so that sealed the deal. inside, it’s got a cell phone pocket made of the same leather and a zipper pocket. a purse without interior organization is a black hole being sucked into a vortex. it’s big enough to fit a magazine and my water bottle. now THAT’s a win. 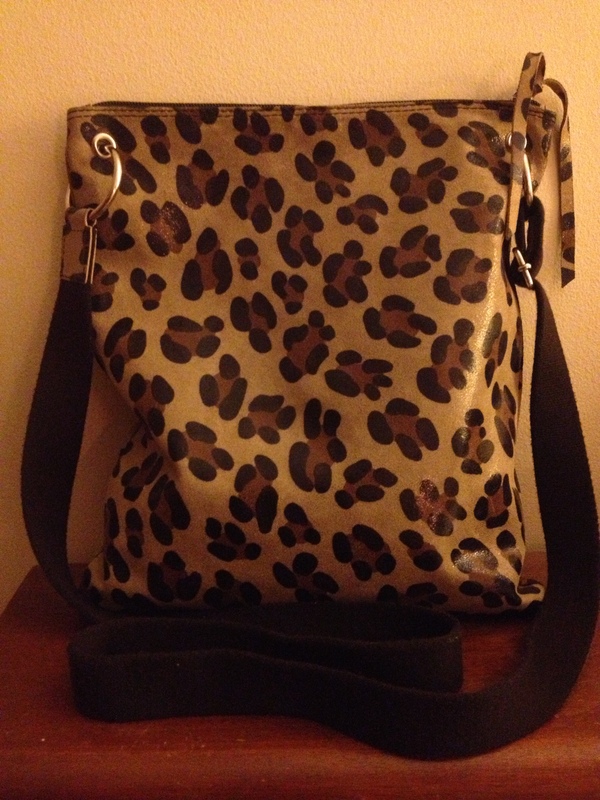 i got this gorgeous bag a couple of years ago, when leopard was really “in” and everywhere. 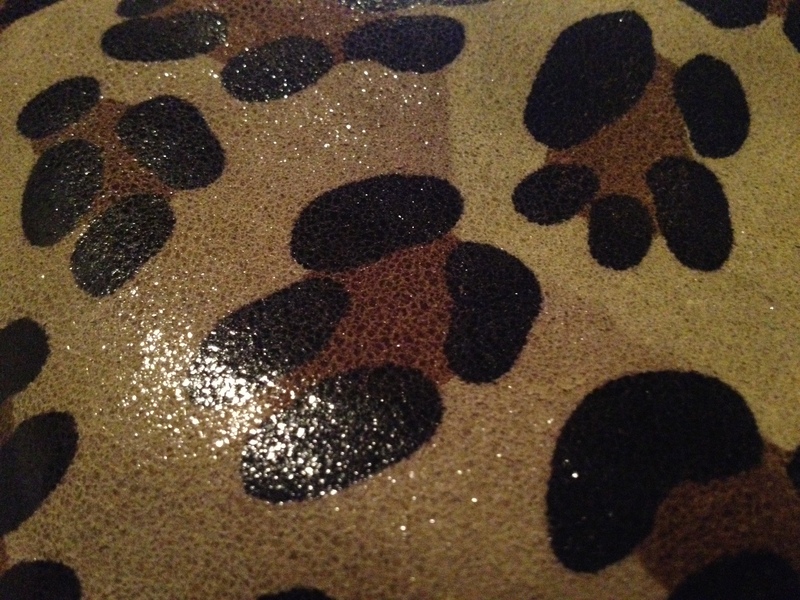 i was drawn to the abstractness of the leopard print. even if i choose to follow a trend, i like to have something different and unique. this is a case where all of the thrifting can afford me the occasional opportunity to purchase something special that i really like. i wore this to church today, then out to dinner at the famous Montgomery Inn Boathouse. another reminder of how much i love this bag. This entry was posted in tj maxx and tagged Animal print, bargain, church, clearance, Italian leather, leopard print, Maurizio Taiuti, Shopping, tj maxx on April 7, 2013 by miriamgmck.